Shares dropped to a low of Rs328.40 on the BSE, a drop of Rs3.6 from today’s opening of Rs332 on the BSE, as the company’s net profit plummeted by 76% in Q3FY19. Shares of BPCL dropped ~1% in intraday trade on Monday after declaring their Q3 results. Shares dropped to a low of Rs328.40 on the BSE, a drop of Rs3.6 from today’s opening of Rs332 on the BSE as the company’s net profit plummeted by 76% in Q3FY19. Bharat Petroleum Corporation Ltd's Q3FY19 results beat the estimates on the revenue and PAT fronts. The company's net revenue in the quarter grew 30.6% yoy to Rs79,168.84cr against Rs60,623.04cr in Q3FY18, beating the estimates of Rs73,255cr. EBITDA for the quarter declined 77% yoy to Rs737.36cr against Rs3,206.74cr last year. Read more. The Kochi refinery ran 100%, and all the secondary units have been stabilized. 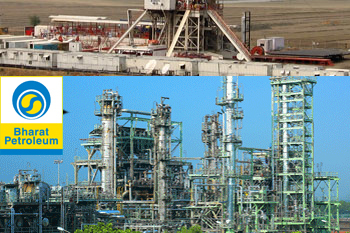 BPCL will start to focus on optimizing GRMs, which are expected to improve by $1.5/bbl for the entire expanded capacity. The downstream petrochemical integration project at Kochi is on track for completion by FY20E. Bharat Petroleum Corporation Ltd is currently trading at Rs333.45 down by Rs16.55 or 4.73% from its previous closing of Rs350 on the BSE. The scrip opened at Rs332 and has touched a high and low of Rs337 and Rs328.40 respectively. So far 29,43,367 (NSE+BSE) shares were traded on the counter.